When and How to Use Chandra PRoVis. 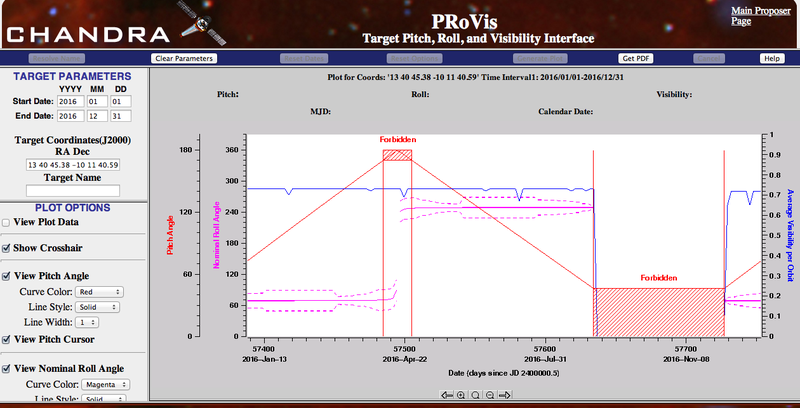 PRoVis is a web-based application that allows viewing and interactive manipulation of Roll, Pitch and Visibility Plots. The plot uses a recent projected Chandra ephemeris. Since Chandra's orbit does not change much from year-to-year, plots are also closely applicable for any mission year. The plots are generated directly into the browser, unless pdf is requested. In this case the browser needs to have an external viewer configured to retrieve and view pdf files. As visible in the PRoVis website, the PRoVis GUI consists of 4 elements: buttons frame at the top, target parameters frame and plot options frame both on the left, and the main plot frame in the middle. To use: enter the J2000 sky coordinates of the source of interest in the boxes on the left in the target parameters frame, then press enter or click on the "Generate Plot" button at the top of the page. Alternatively, type in a target name in the "Target Name" input box on the left, then either press return, which will resolve the name to sky coordinates, or click on "Generate Plot" which will resolve the name to coordinates and generate the plot in one step. Please read about pitch angle restrictions in Section 3.3.3 of the Proposers' Observatory Guide (POG). This thread demonstrates how proposers should use PRoVis in several different proposal examples. If an observation has a roll constraint (e.g. a gratings observation that requires two nearby sources to be spatially resolved, with distinct spectra), the observer should use PRoVis to check that this roll constraint does not force the target to be at bad pitch. An observer wishes to use ACIS-S to image a pair of O4 stars that constitute a visual binary in M17. In order to obtain spatially resolved, simultaneous X-ray grating spectra of the two O4 stars, the Chandra spacecraft must be within a narrow range of roll values. PRoVis can be used to see whether these roll constraints force the target to be at bad pitch, so that the observer will know if the plan is feasible, or whether the constraints must be relaxed. The plot will look like this. The roll constraint (specified by the observer) for this observation is 120 degrees with a 15 degree tolerance. Looking at the above PRoVis plot for the Cycle 18 time frame, we can see that a restriction between 105 and 135 degrees requires the observation to be done between May 28 and June 18, 2017. By tracing the mouse cursor along the roll curve to a roll of 105 degrees, we see that roll is nominal on May 29, when the target pitch is 151 degrees. This can also be seen directly from the Plot Data by clicking the View Plot Data button in PRoVis. This is what you'll see upon clicking the "View Plot Data" button. A proposer wishes to observe the Vela Pulsar Wind Nebula (PWN) with ACIS-S while ensuring that the "trailed image" does not contaminate the regions of interest within the target. Such an observation requires avoiding roll angles of 40-80 degrees and 220-260 degrees. The resulting roll constraint (150 degrees with a 70 degree tolerance) is pretty workable. However, if the observers want to study temporal variations in the structure, such as taking eight 40-ks observations with one-week intervals (a Monitoring observation), this presents further scheduling restrictions: the proposer must make sure that there are significantly large chunks of time in which the target is at suitable pitch and roll for the monitoring observation to take place. The plot (for coordinates 08 35 20.70 -45 10 35.70) will look like this. By studying the above PRoVis plot we can see that roll and pitch restrictions would allow for this monitoring observation to be feasible from January to May of 2017, when the roll fluctuates roughly between 85 and 156 and the pitch varies from 2.5 to 27 and 261 to 359. The observation would also be feasible from the middle of June to the end of October of 2017, when the roll is between 82 and 220 and the pitch varies from 79.6 to 107.1. A window-constrained observation must take place within a specific time window, due to some time-critical aspect of the target. Read about other types of time constraints at Section 3.4.2 of the POG. Any proposer placing a window constraint on his or her observation must use PRoVis to check that this constraint does not force the target to be at bad pitch. An example of a window-constrained observation is the coordination of Chandra time with another space mission, e.g. NASA's Deep Impact mission in July of 2005. The Deep Impact investigators wished to use Chandra's ACIS-S for spectroscopic imaging of comet 9P/Tempel 1 before, during, and after a 370-kg impactor collided with the comet. Entering the coordinates of 9P/Tempel 1 in July 2005 (13 40 45.38 -10 11 40.59) should produce a plot like this (using 2016 as the year, since the plots change little from year-to-year). By breaking the proposal into 35 observations of 7-10 ks each, between June 30 and July 24, this proposal was made feasible, even though the pitch was not ideal. If a proposal's science is dependent upon the exposure being uninterrupted, this places constraints on when and how Mission Planning can schedule the observation. Thus, the proposer should use PRoVis to determine how feasible it is to obtain the uninterrupted observation. For example, to constrain both thermal and nonthermal coronal properties of a pole-on binary system, proposers wanted to simultaneously image the binary with Chandra, the VLA, and the VLBA. In addition, they required that the two 40-ks observations with Chandra (80 ks total) were each uninterrupted. Since this is not only an uninterrupted proposal, but also a joint proposal, there are two types of constraints to check. A plot showing the various restrictions on uninterrupted observations of a pole-on binary system (at RA: 13 34 47.8, Dec: +37 10 56.7). The block of time from January 1st to Sep 7th, as well as Oct 18th to Dec 31st seems to be feasible for this example. The PRoVis Plot above shows that the target resides at good pitch for a nice chunk of time. This should make two 50-ks Chandra observations feasible, but whether the target can be observed at the VLA and VLBA in that window is another question for the proposer to address. For joint observations with ground-based optical telescopes, the Chandra observation is further constrained by whether the target is visible from the ground at a given time of year. Note that Chandra coordination with ground-based observatories other than NRAO is only available as a preference and will be carried out on a best-effort basis. Before triggering a Target of Opportunity (TOO), an observer must use PRoVis to check that the target is not at bad pitch. Since TOO's must be observed within either 0-5, 6-15, 16-30, or >30 days, there is an effective time constraint whenever a TOO is triggered. It is especially important to check that the TOO is feasible when the observation includes an additional constraint, e.g. the exposure must be uninterrupted. For example, an observer may trigger a TOO when a nova, in outburst, is observed to turn into a luminous supersoft X-ray source with Swift. In addition, part of the science is dependent on obtaining an uninterrupted observation. When we enter the coordinates of the nova (at RA: 03 05 58.6 and Dec: 05 47 15), PRoVis produces this plot. If the proposer triggered this particular observation on December 16, we can see from the plot that the target would be at good pitch continuing through the end of the cycle.